Sean Thomas Mannion (born April 25, 1992) is an American football quarterback for the Minnesota Vikings of the National Football League (NFL). He played college football at Oregon State and was the Beavers' starting quarterback from 2011 to 2014. He was drafted by the St. Louis Rams in the third round of the 2015 NFL draft. Born in San Jose, California, Mannion attended Foothill High School in Pleasanton, California. Not only did Mannion play football, but he also played on the baseball varsity team as a pitcher in his junior and senior year and he also played on the junior varsity basketball team but never made the varsity team. As a senior, he played in 12 games and threw for 3,521 yards and 27 touchdowns, in his first year as the starter for the Varsity high school football team. He came out of high school as a three-star recruit according to ESPN. On February 3, 2010, he signed with Oregon State, turning down offers from San Diego State, San Jose State, UCLA, and Washington State. Mannion was redshirted as a freshman in 2010. As a redshirt freshman in 2011, he started 10 out of 12 games. He finished the season completing 305 of 473 passes for 3,328 yards, 16 touchdowns, and 18 interceptions. During his sophomore season in 2012, Mannion completed 200 of 309 passes for 2,446 yards, 15 touchdowns, and 13 interceptions. Mannion remained the starter in 2013. On September 21, 2013, Mannion threw for five touchdown passes against the Utah Utes, tying a school record held by Derek Anderson. The next game, On September 28, Mannion threw for six touchdown passes against the Colorado Buffaloes, setting a new school record for most passing touchdowns in a game. Mannion finished the 2013 season leading the Beavers to a 7–6 record, including a victory in the Hawaii Bowl over the Boise State Broncos on Christmas Eve. In the final game, Mannion threw for 259 yards, giving him a Pac-12-record, 4,662 yards passing for the season. He finished the season with a school-record 37 passing touchdowns. Remaining the starter his senior season in 2014, Mannion became the Beavers all-time leader in career passing yards and passing touchdowns during the season, passing Derek Anderson's records. Later in the year, he became the Pac-12's all-time leader in passing yards, breaking Matt Barkley's record. He finished the season with 3,164 yards and 15 touchdowns. For his career, Mannion started 43 games, completing 1,187 of 1,838 passes for 13,600 yards, 83 touchdowns and 54 interceptions. Mannion was rated as the sixth best quarterback in the 2015 NFL Draft by NFLDraftScout.com. Mannion was selected by the St. Louis Rams in the third round, 89th overall, of the 2015 NFL Draft. He started his career as the third-string quarterback behind Case Keenum and Nick Foles in his rookie year in 2015. Mannion played in his first NFL game of his career during a Week 12 matchup against the Cincinnati Bengals in which the Rams lost 31-7. He was put in the game late in the fourth quarter, in relief of Case Keenum. He completed 6 passes out of 7 attempts for 31 yards, posting an 85.1 passer (QB) rating. Mannion started 2016 as the second-string backup quarterback behind starter Case Keenum and ahead of the first overall pick of the 2016 NFL Draft, Jared Goff. In the season-opening 0-28 loss against the San Francisco 49ers, Goff took over as the second-string quarterback, demoting Mannion back as the third-string backup quarterback. Mannion was promoted to second-string for the final two weeks of the season. In Week 17, on New Year's Day, Mannion completed 3 of 6 passes for 19 yards and an interception after starter Jared Goff was subbed out of the game in a 44-6 blowout loss to the Arizona Cardinals. Mannion started the 2017 season as the backup to Goff after Keenum went to the Minnesota Vikings during free agency. In the season opener against the Indianapolis Colts, Mannion came into the game to finish up in relief of Goff after the Rams were up 46–9 and again in Week 15 when they were up 42–7 over the Seattle Seahawks. Due to head coach Sean McVay resting most of his starters for the playoffs and having the playoff seed locked in, Mannion started the regular season finale against the San Francisco 49ers. Mannion was 20-of-34 for 169 yards with no touchdowns or interceptions in the 34–13 loss. With Goff remaining as the starter, Mannion appeared in three games in relief roles in the 2018 season. The Rams reached Super Bowl LIII, but lost 13-3 to the New England Patriots. On April 7, 2019, Mannion signed with the Minnesota Vikings. ^ Stephens, Mitch. "QB Mannion rises from Foothill High to top of NCAA". SFGate. Retrieved January 25, 2018. ^ FitzGerald, Tom (November 4, 2011). "Sean Mannion showing promise as Oregon St. QB". SFGate. Retrieved January 24, 2019. ^ "Sean Mannion 2011 Game Log". College Football at Sports-Reference.com. Retrieved January 25, 2018. ^ "Oregon State at Utah Box Score, September 14, 2013". College Football at Sports-Reference.com. Retrieved January 25, 2018. ^ "Colorado at Oregon State Box Score, September 28, 2013". College Football at Sports-Reference.com. Retrieved January 25, 2018. ^ "Hawaii Bowl - Boise State vs Oregon State Box Score, December 24, 2013". College Football at Sports-Reference.com. Retrieved January 25, 2018. 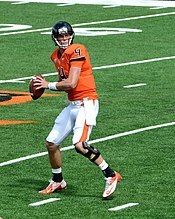 ^ "Mannion embarks on final season with the Beavers". College Football. ^ "Oregon State QB Sean Mannion returning to Beavers". College Football. ^ "Sean Mannion becomes Oregon State Beavers' all-time leading passer during third quarter of San Diego State game". OregonLive.com. ^ "Arizona State vs. Oregon State – Game Recap – November 15, 2014 – ESPN". ESPN.com. ^ "Losses overshadow record to Oregon State's Sean Mannion". ESPN.com. ^ "As Oregon State Beavers' Sean Mannion sets Pac-12 passing record, loved ones reflect on journey". OregonLive.com. ^ "Sean Mannion 2014 Game Log". College Football at Sports-Reference.com. Retrieved January 25, 2018. ^ "Sean Mannion Career Game Log". College Football at Sports-Reference.com. Retrieved January 25, 2018. ^ "Sean Mannion". sports-reference.com. Sports Reference LLC. Retrieved September 9, 2016. ^ McGinn, Bob (April 23, 2015). "Rating the NFL draft prospects: Quarterbacks". JSOnline.com. Archived from the original on July 4, 2017. Retrieved June 16, 2018. ^ "Sean Mannion". nfldraftscout.com. Retrieved September 9, 2016. ^ "2015 NFL Draft Listing". Pro-Football-Reference.com. Retrieved January 25, 2018. ^ Patra, Kevin (May 1, 2015). "St. Louis Rams take Oregon State QB Sean Mannion". NFL.com. Retrieved April 28, 2016. ^ "St. Louis Rams at Cincinnati Bengals - November 29th, 2015". Pro-Football-Reference.com. Retrieved January 25, 2018. ^ "Arizona Cardinals at Los Angeles Rams - January 1st, 2017". Pro-Football-Reference.com. Retrieved January 25, 2018. ^ "Los Angeles Rams at Seattle Seahawks - December 17th, 2017". Pro-Football-Reference.com. Retrieved April 7, 2018. ^ "San Francisco 49ers at Los Angeles Rams - December 31st, 2017". Pro-Football-Reference.com. Retrieved January 25, 2018. ^ "Sean Mannion 2017 Game Log". Pro-Football-Reference.com. Retrieved January 25, 2018. ^ "Sean Mannion 2018 Game Log". Pro-Football-Reference.com. Retrieved January 24, 2019. ^ Bergman, Jeremy (April 7, 2019). "Vikings signing Sean Mannion to back up Kirk Cousins". NFL.com. ^ "Sean Mannion". pro-football-reference.com. Sports Reference LLC. Retrieved September 9, 2016.